Click on the links or the picture to open product catalog page. 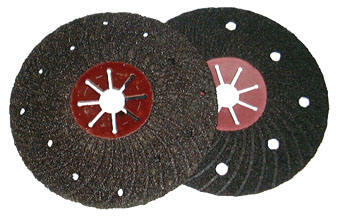 Resin fiber discs are used with right angle grinders or sanders. They require a backup pad. The discs are attached to the pad with a nut that goes through the disc arbor hole. Hook & loop AO paper discs are used on dual action DA sanders or straight rotation tools. They attach to the backup pad on the tool with a Velcro connection. Usually used on wood or metal. Hook & loop SC paper discs are wet/dry silicon carbide for use on granite/marble/ stone type materials. They have a center hole for use with water feed tools. PSA SC paper discs are adhesive backed wet/dry silicon carbide discs that attach to a backup pad with plain vinyl surface. Silicon carbide for use on granite/marble like material. Cloth PSA discs (pressure sensitive adhesive) discs are heavier than paper PSA discs and are typically used on stationary tools. Quick change sanding discs attach to rubber holders with a simple twist on/off action. Wavy edge hook and loop sanding discs. Ideal for wood turning projects. Flap Discs - Out last resin fiber discs by 15-20 times. Semi-Flex Discs. Use for heavy stock removal and weld blending. Trim-Kut discs - Discs with polymer plastic back for long life. Mini GrindR quick change discs - Polymer back sanding discs with a Type R quick change holder.